More weird stuff from the labour market. This chart from the OBR’s recent Economic and fiscal outlook shows how the wage distribution has shifted downwards over the last four years. Although, the number of people in work is higher than it was four years ago, there are now fewer people earning over £20,000 a year (at 2014 prices) than there were in 2010. That’s really odd when you look at the growth in employment by occupational group over the same period. The ONS has reclassified some jobs since I last looked at this, reducing the number in the high skill groups. Even so, around 60 percent of the increase in employment has been in the managerial, professional and associate professional groups. Look at the two graphs side by side. Something funny is going on. 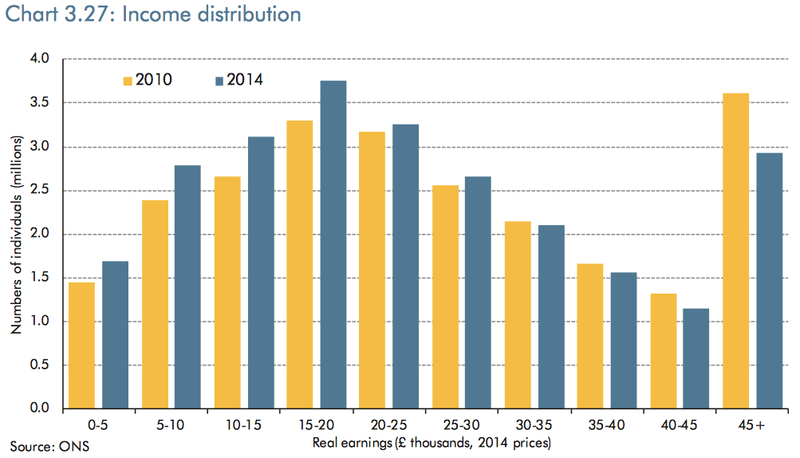 We have more workers in the high skilled job categories but fewer earning over the equivalent of £20,000. This is yet more evidence of the downward slide in pay rates for high skilled jobs. The numbers on both charts only cover employees. The picture would almost certainly look even worse if we had similar pay data for the self-employed. Last week, I went to the UKCES Careers of the Future event. One of the speakers said that all the ‘Youth of Today stereotypes were wrong – apart from one: a lot of youngsters do tend to have unrealistic salary expectations. This is probably nothing new. When I was at university in the 1980s, I met people who thought that getting a degree would make them rich. Gaining skills and qualifications has never been a route to riches though. However, it used to be a route to security, a reasonable degree of comfort and what we used to call solid respectability. Nowadays, I’m not sure it’s even that. There are still good reasons for gaining skills and qualifications though. For those without them, the future looks pretty grim. Even with a high skill job, you might still end up with low pay and little security. Without skills and qualifications, though, you almost certainly will. This is why Basic Income is very much needed. If BoE wanted to save the economy, then they should stop wastin money on QE and instead promote Basic Income. Wasting money on QE ? Definitely . So called Basic Income ? Just another illusion there’s an easy way out . Even the Green Party can’t show its workings . It’s the market place and you’ll never beat it . Rick , no truly skilled person or what used to called tradesman (tradesperson seems clumsy) I know is earning anything like £20000 more like double that at least . Think there is something iffy about the categorisations. Looking down the EMP04 s/sheet for ‘Skilled Trades’ I see ‘Farmers’. Now Farmers either own or rent the land and are really ‘Professionals’ or they are farm workers and these days are likely self employed. A big pay disparity here. Then there are machine setter/operators who these days operate a high-end CNC machine but only get about £27-30K – not exactly brilliant. Could it be that whoever fills in the stats categorises workers as ‘high skilled’ when really they are for 2014’s world of work ‘average skill’. But to do that might make those genuinely classed as ‘Professional’ stand out as rather fewer but very much better rewarded. I don’t disagree with the general message but I smell statistical rats. What the graphs show is that with the sole exception of the absolute poorest in society, we are all financially worse off than we were 5 years ago. This means we are all still paying the price for the banking sector “bust” of 2008-09. It also reflects the new shallower martini glass distribution of our society, where only a tiny few at the top of the income chain are getting any better-off. Quite when, if ever, the current situation will change is frankly impossible to know. Only when a redistributionist party gains political power will this current unfair situation change for the better. Interesting stuff but shouldnt it be fewer people earning over £30 k not £20 k ? So I went and dug out the raw figures and they were right; fewer people earning over £20k equivalent. The delayering and casualisation of white collar work continues. I’d link a lot of this to the self-employment stuff you have been a great observer of. Many white collar workers have been downsized into contract/interim/consultancy work. Even many of the ones who are paid well for their work face underemployment. I’ll further note that the triumphalist poster above crowing about the returns to “truly skilled” tradesmen is in fact highlighting how much our economy is not working. In a functioning market, said skills would not be in short supply. Not in any way ‘triumphalist’ or even ‘crowing’ , simply remarking that my experience doesn’t match the OBRs report . Also , it certainly doesn’t show a disfunctional market , quite the reverse . But , joy of joys , you referred to the place of work as , the ‘market place’ . There’s hope yet but I think you’re in need of some of that tonic yourself .